Eeeyha! Posting to you from alyshajane.com’s secret headquarters, complete with lots of pink, kitty and squirrel things. These are all required as alyshajane herself is powered by copious amounts of pink and cuteness. Amongst other things. This post is for Pip’s My Place and Yours. The theme this week comes from Ninon. For this photo I tried my hand at panography, a technique that gives a wide-angle view of a scene comprised of many photos. Like photo stitching, except you can see the joins. I’ve always liked this technique and now that I’ve had a go, I can see many more in my future. You can find a panography tutorial at Photojojo & more examples at Flickr. The three white squirrels in the front aren’t normally in front of my keyboard; cute as they are, they’d make typing a bit difficult. My lovely hubby just bought them for me while we were out doing grocery shopping. Whenever he hears me take a sharp and awe-struck breath or shriek “Eeeeee” he knows that I have spotted either Kitty or Squirrel cuteness. If I see both together at one time, I’d possibly pass out from glee. P.S: I recently tried making a video of my desk/blog HQ which you can see on Flickr. WOW! Love it! 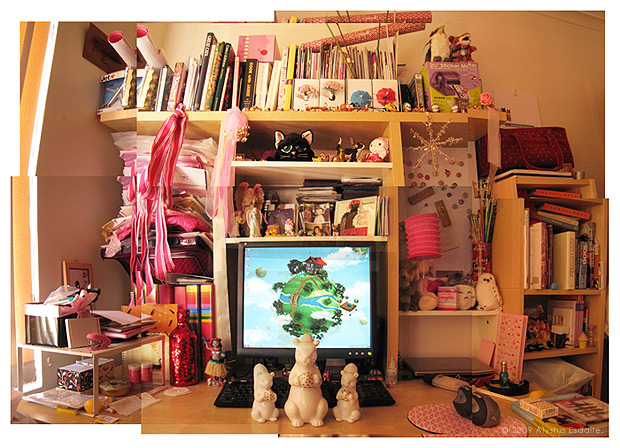 How do you get any work done though, I would just sit there & look at all the lovely things!